Since launching in January 2007, we engage our readers through reports that dig deeper and stories that inspire. 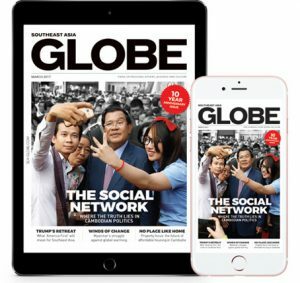 Covering current affairs, business, culture and technology, Southeast Asia Globe fuses informed writing with stunning photography. Our mission is to connect Cambodia with Southeast Asia through first-hand reporting and high-quality information. We probe the news, businesses and ideas that matter to our audience, offering locally- focused content with a global perspective. Having tapped into the incredible growth of the region in the past decade, we continue to explore its transformation in the 21st century and its relationship with the Cambodian Kingdom. Southeast Asia Globe is a truly international title proudly made in Cambodia. Our readers access our content from around the world via our print magazines, websites, social media, apps and events.